A lot of people watch birds but I think they also watch us. I see these two sitting, taking in the sights almost every day. 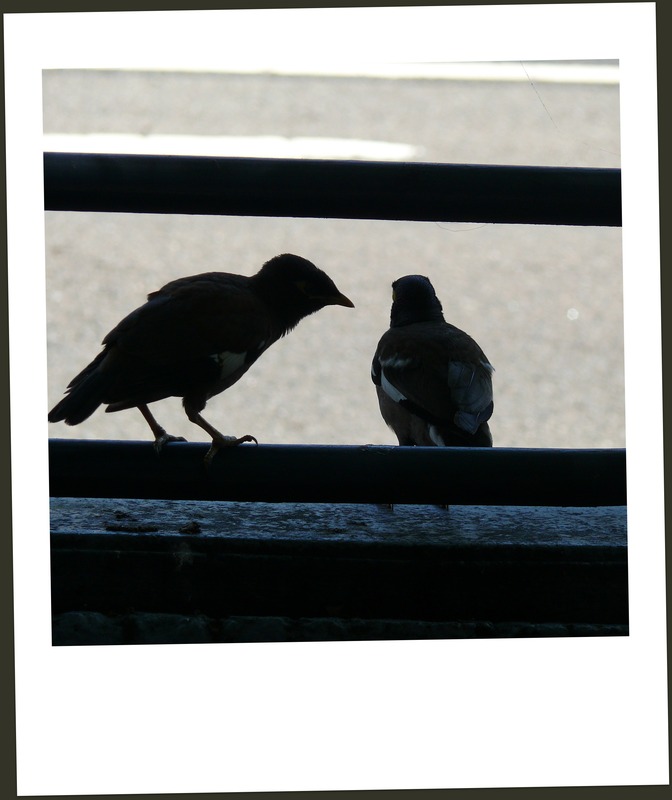 They look and primp and preen their feathers then turn to one another and chirp and twitter. I just know they are having a good old gossip. Every day they are there. It’s a ritual, like two old human friends meeting in the park to read the paper and share a flask of tea. I often wonder what they chirp about. Did you see that collared dove? Oh yeah. She’s put on a lot of weight. She acts all hoity toity with that long tail of hers but you just know she’s eating bread out of the bins when no one’s looking. What about that old cockatoo? Sunflower seeds everywhere. Such a messy eater. I tell you, it’s a disgrace. You should see the state of his nest. Do you think that magpie needs an intervention? Looks like it. He steals sweet wrappers, hairclips, shiny paper. They say he’s a hoarder. Makes me think that birds really aren’t all that different from us. hahahaha – you know I’ve always imagined them gossiping with each other, especially when they’re gathered together on hydro wires in autumn. LOL!!! I know what you mean. The birds that I always remember as looking like “gossips” were the HUGE ravens up North in the Yukon when we lived there. I’m talking BIG BIRDS and yes, they did often look like they were having a good-old-gab about the humans they were checking out below them. I hope they were saying nice things about me, ’cause I liked them! 🙂 I loved this, thanks for making me smile. Oh my goodness, I thought I was the only person on the planet that imagines birds having a good old fashioned gossip session!!!! Ahahahhahahahahahahhahhahaaha. When you see Galahs on slippery-dips, and pelicans wind gliding, you just know they ejoy more than the bare necessities! So a chat? Why not. In Tiziana, some mornings, when the companionways are all open, a willy wagtail flies in and sits on a line where I dry clothes and talks to me. He/she chatters away, tail wagging energetically while I scramble for my camera. It now sits beside the computer waiting but I have yet to be quirk enough. When she has said her piece, she flies out again, does an encore on the rail then is gone for maybe two or three weeks! Because it has happened about six times over the last six months, it is clearly deliberate behaviour! Will have to learn to speak Bird like you! Bwahahaha – love this post Selma. It’s funny but just yesterday I was watching 4 crows near my house and they were all having a ‘conversation’ or maybe an argument – one of them had some food in the mouth – what a commotion. The Aussie magpies love to collect shiny things. They are into bling big time. When I first came to Australia I was walking home from school and I had two gold hairclips in my hair. A magpie swooped on me trying to pull them out. He got away with one of them. I nearly had a heart attack! I would say it’s the same dove. I have one who visits me too. It makes me happy to get that visit every day! I think they love a good gossip. Imagine what they can see from the wires. No one would have any secrets from that vantage point. Haha. I know what you mean about ravens. They often look they’re plotting something. I think they are glorious birds! I think they gossip too. how funny we both thought the same thing! I’ve never seen a galah on a slippery dip but I can imagine them doing it. I absolutely love galahs – they are like little cartoon characters. You are so lucky to have a willie wagtail visit you like that. That’s considered to be really good luck. I love the willies – they are so cheeky. Such characters! They really carry on sometimes, don’t they? I love to watch the birds. It’s so entertaining! this made me smile! There are some species of birds that are definitely gossips! I always imagine that dogs & cats have conversations and sometimes their expressions can really let us know what they’re thinking. I think that’s what I love Lolcats & Loldogs so much and why I love this post so much! Not so long ago, I wondered why galahs, rosellas and things always seemed to ‘moon’ wherever they had a camera pointed at them. I love to see the birds gossiping. It always makes me smile too! I love the LOLCATS too. Cracks me up on a regular basis. I think dogs and cats chat too. They often appear to be having conversations! Hahaha. Maybe they think the mooning side is their better side. LOL! I would love to know their secrets. I am pretty sure they don’t miss much! Thank you so much for that link. What an amazing blog. The mourning doves are among my most favourite birds ever. Love them!! Awwww. That is really cute. I do think birds (and probably most other living things too) have relationships just like ours. They squabble and boss one another around just like we do. It is very funny to watch. What a great story!